I remember, as a child, making shadow puppets with a flashlight. My brothers and I, usually while camping in a tent, would twist our hands and fingers into various shapes and shine the light on them to amaze each other with shadows that mimicked animals and other creatures. Emmeline, in Shadow Weaver by MarcyKate Connolly, has an uncanny ability to control shadows that extends beyond simply making shadow puppets. She can weave shadows into almost anything she can think of, use them for her own protection, and even communicate with her own shadow. Emmeline is proud of her shadow weaving, but not everyone appreciates her magic. Her parents decide to send her to Lady Aisling, who promises to cure Emmeline so she will no longer have her magical abilities. Emmeline and her shadow, Dar, run away into the woods where they meet a boy, Lucas, with his own form of magic. Not only are Lady Aisling's guards looking for Emmeline, but Dar wants to become a real girl and needs Emmeline to help her. Emmeline becomes torn between her shadow friend, Dar, and Lucas and his family who have helped her to escape danger. 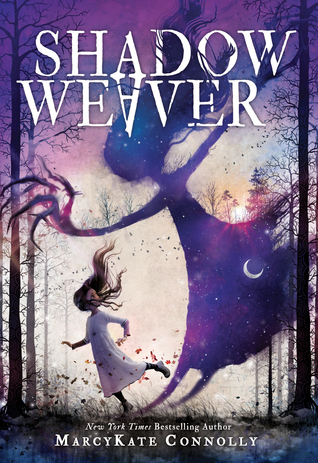 The plot of Shadow Weaver is both mysterious and thrilling as Emmeline and her new friend Lucas must defend themselves from those who want to harm them. In the midst of Emmeline's fight to keep her magic, she also struggles with decisions she has to make about where her loyalties lie. Emmeline also learns an important lesson: friends may not always be well-intentioned. With magic and the juxtaposition of light versus dark and good versus evil, this fantasy is a little creepy, but also enchanting. This is an intriguing book for readers looking for an imaginative and magical story that will give them a bit of a chill. There is a second book planned as the ending leaves readers anticipating a sequel. I thank the author, MarcyKate Connolly, for providing me and my book review group, #BookExcursion, with an advanced reader copy of the book. The book publishes in January.